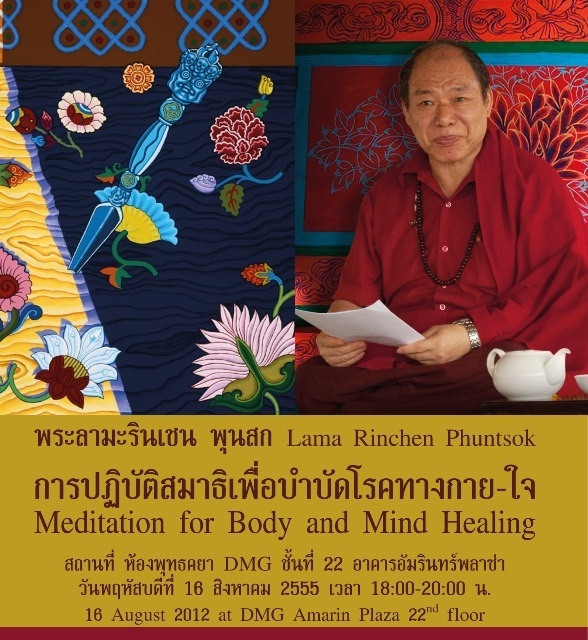 You are invited to the “Introduction to Meditation” Dharma talk by Lama Rinchen in Bangkok on Friday 29th January 2016. This talk will cover basic principle and essence of meditation which will be useful for all levels of practitioners from beginner to advanced. Directions: Windsor Tower Apartment is located right opposite Windsor Hotel in Sukhumvit soi 20 which is near BTS-Asoke/MRT-Sukhumvit lines. The entrance to the building is next to “THEE” hotel. Please tell the guard that you come to see Ram in unit 20B which is on 20th floor. 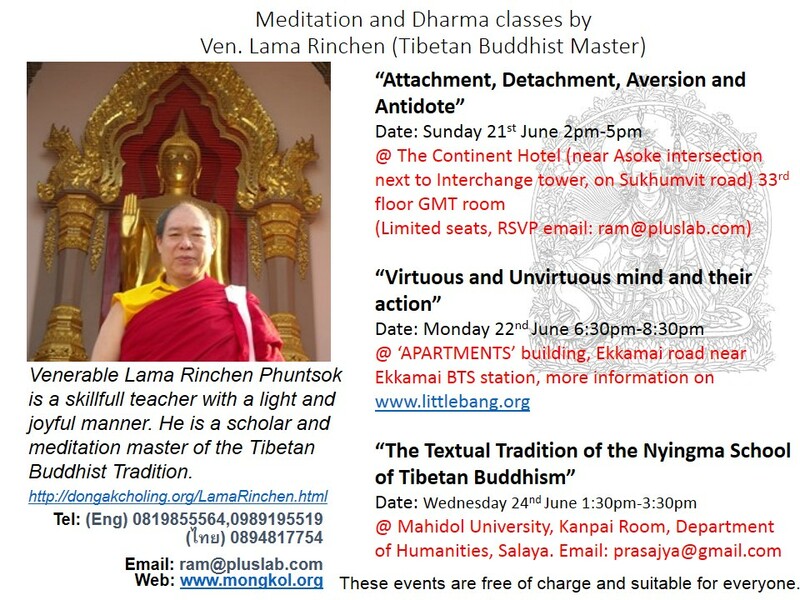 The Venerable Lama Rinchen Phuntsok is a skillfull teacher with a light and joyful manner. 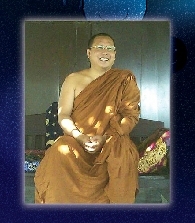 He is a scholar and meditation master of the Tibetan Buddhist Tradition. Please do not to bring your car as parking spaces are very limited. Feel free to email or call me at ติดต่อ/สอบถามเพิ่มเติม 0819855564. Ven. 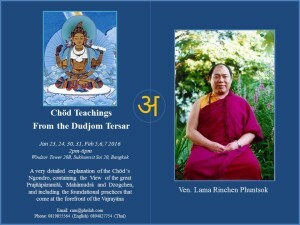 Lama Rinchen will offer a very detailed explanation of the Chöd Ngondro, which contains the View of the great Prajñāpāramitā, Mahāmudrā and Dzogchen, and which includes the foundational set of practices that come at the forefront of most Vajrayāna systems. Venue: Windsor Tower apartment unit 20B, opposite Windsor hotel on Sukhumvit soi 20. Easily reachable via BTS Asoke/MRT Sukhumvit station. Cost: Baht800 per person to cover the cost of text which will be used and remaining will be made as a donation to the Lama. According to Mahayana Buddhists, emptiness is the ultimate wisdom of understanding that all things lack inherent existence. 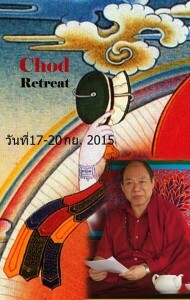 Chöd combines prajñāpāramitā philosophy with specific meditation methods and tantric ritual. The chod practitioner seeks to tap the power of fear through activities such as rituals set in graveyards, and visualisation of offering their bodies in a tantric feast in order to put their understanding of emptiness to the ultimate test. The Venerable Lama Rinchen Phuntsok is a skillfull teacher with a light and joyful manner. He is a scholar and meditation master of the Tibetan Buddhist Tradition. Born in Tibet, Lama Rinchen began receiving instruction in the traditions of Tibetan Buddhism at the age of six in Tsasum Chokhorling Monastery in Tibet. After he left Tibet in 1958, he studied at Young Lama’s Home School in Dalhousie, The Buddhist Monastic School in Rewalsar, Nyingmapa Lama’s College in Dehra-Dun, and Zongdog Palri Monastery in Kalimpong. Lama Rinchen graduated from Sanskrit University in Varanasi India where he completed advanced studies in Sutrayana Buddhist philosophy and scriptures, commentaries, logic, literature, history, and the major sciences of the Tibetan curriculum. To complete his training in Vajrayana Nyingma School studies, he served as private secretary to the late His Holiness Dudjom Rinpoche, supreme Head of the Nyingma order of Tibetan Buddhism for over fifteen years. During that time he received all the important empowerments, transmissions, essential instructions, the oral teaching of Nyingma Kama, and the Profound Rediscovered Teachings of Terma of the great Lotus Born Teacher, Guru Padmasambhava, the founder of Vajravana Buddhism. Venue: About 2-3 hours out of Bangkok, we will keep you informed. Limited places available, kindly signup at your earliest convenience. This retreat is suitable for all levels of practitioners. We would like to invite you to public Dharma talks be Ven. 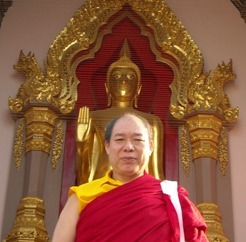 Lama Rinchen Phuntsok in Bangkok areas in June 2015. 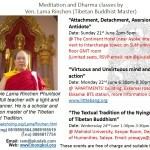 Venerable Lama Rinchen Phuntsok is a skillfull teacher with a light and joyful manner. He is a scholar and meditation master of the Tibetan Buddhist Tradition. These events are free of charge and suitable for everyone. Kindly help forward to message to those who might be interested as well. The talk will focus on how to keep focused meditation while performing different activities. This is a special session which the Abbot will give personal guidance to each and everyone. You can join in even after the session has started. 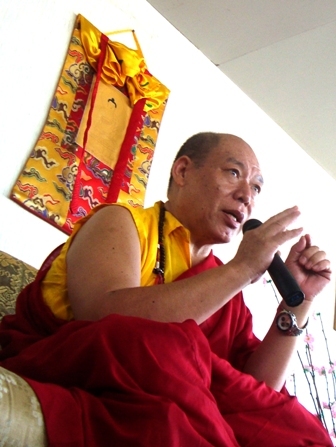 Lama Rinchen Phuntsok will be giving Dharma teachings about “Meditation for Body and Mind healing” on Thursday 16th August 2012 from 6pm to 8pm. Venue: DMG books company, Amarin plaza 22nd floor, BTS station Chitlom. diseases, Lotus Born Padmasambhava has given many special techniques to protect us. One of these will be featured in the Dharma talk session. การปฎิบัติพื้นฐานแห่งธรรม บรรยายและปฏิบัติร่วมกันโดย พระลามะ รินเชน พูนสก วันพุธที่ 8 สิงหาคม 2555 18:30น.-20:30น. “Meditation and healing” retreat in Huahin (3 hours south of Bangkok), accommodation will be provided in few cottages and tents. Retreat starts on Saturday day time and ends on Monday afternoon, it will be helpful if you can manage to get there by yourself but if cannot then we can try to put you on some of other participants’ car if available (you might be required to help pay for some gasoline). The Venerable Lama Rinchen Phuntsok is a skillful teacher with a light and joyful manner. He is a scholar and meditation master of the Tibetan Buddhist Tradition. Born in Tibet, Lama Rinchen began receiving instruction in the traditions of Tibetan Buddhism at the age of six in Tsasum Chokhorling Monastery in Tibet. After he left Tibet in 1958, he studied at Young Lama’s Home School in Dalhousie, The Buddhist Monastic School in Rewalsar, Nyingmapa Lama’s College in Dehra-Dun, and Zongdog Palri Monastery in Kalimpong. Lama Rinchen graduated from Sanskrit University in Varanasi India where he completed advanced studies in Sutrayana Buddhist philosophy and scriptures, commentaries, logic, literature, history, and the major sciences of the Tibetan curriculum. Location: Rai rak thamma-chat west of Huahin downtown about 45 minutes by public bus. If you are coming from Huahin town, take public transport (a truck with roof on the back) to Pa-la-oo waterfall and on the way you’ll see Tibetan temple on the left side, about 500 meters past that on the right side is the outer entrance to the retreat center area, come inside until you meet us. The above costs do not include transportation cost from Bangkok to Huahin and back. In the case where there are not enough cabins for everyone then accommodation will be provided in tents. So if you can bring tents for yourself and others, please let us know, we might need to borrow them. If you’ll be coming to this retreat from overseas then please contact us and let us know your travel plans so we can assist you properly.